Sending flowers and gifts to clients anywhere in South Africa has never been easier! NetFlorist has Hubs situated in all major cities across the country, and also deliver countrywide through a network of preferred florists and courier services around South Africa as well as internationally. Thinking of buying a corporate gift? Think NetFlorist! You can redeem your rewards points at NetFlorist with your activated Business Rewards Card. If you haven’t yet activated your Business Rewards Card, you can do this online, or by calling the Business Rewards contact centre on 0860 UCOUNT (82 68 68). Your Business Rewards card must be activated in order to get your 3D SecureCode when redeeming your rewards points online. For more information about 3D SecureCode click here. If you don’t have enough rewards points to pay for your purchase in full, you can use your qualifying Standard Bank Business Credit or Cheque Card to pay the difference. To view your rewards point balance, log onto your Business Rewards profile or SMS the word ‘BALANCE’ to 32700. SMS costs R1. 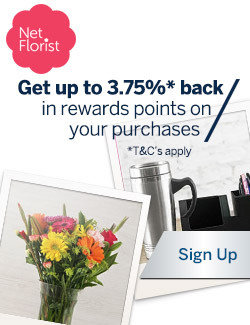 Your rewards points cannot be refunded back into your Business Rewards Card if you return goods that were purchased with your rewards points – you will be refunded with a Netflorist gift card or according to Netflorist’s return policy. Redemption is limited to 300 000 rewards points(R30 000) per transaction/per month. Rewards points can only be redeemed at Netflorist online. Netflorist does not accept debit cards for online payment.